This article series tells the story of where the different streams arose and how they have interacted, beginning with the explosion of interest in the field during and after World War II (for a longer view, see “A Brief History of Decision Making,” by Leigh Buchanan and Andrew O’Connell, HBR, January 2006). The goal is to make you a more informed consumer of decision advice—which just might make you a better decision maker. Missed either of the first two parts? Go back to Part 1 (The Rational Revolution), or Part 2 (Irrationality’s Revenge). The Kahneman-Tversky heuristics-and-biases approach has the upper hand right now, both in academia and in the public mind. Aside from its many real virtues, it is the approach best suited to obtaining interesting new experimental results, which are extremely helpful to young professors trying to get tenure. Plus, journalists love writing about it. Decision analysis hasn’t gone away, however. HBS dropped it as a required course in 1997, but that was in part because many students were already familiar with such core techniques as the decision tree. As a subject of advanced academic research, though, it is confined to a few universities—USC, Duke, Texas A&M, and Stanford, where Ron Howard teaches. It is concentrated in industries, such as oil and gas and pharmaceuticals, in which managers have to make big decisions with long investment horizons and somewhat reliable data. Chevron is almost certainly the most enthusiastic adherent, with 250 decision analysts on staff. Aspects of the field have also enjoyed an informal renaissance among computer scientists and others of a quantitative bent. The presidential election forecasts that made Nate Silver famous were a straightforward application of Bayesian methods. Those who argue that rational, optimizing decision making shouldn’t be the ideal are a more scattered lot. Gigerenzer has a big group of researchers at the Max Planck Institute for Human Development, in Berlin. Klein and his allies, chiefly in industry and government rather than academia, gather regularly for Naturalistic Decision Making conferences. Academic decision scholars who aren’t decision analysts mostly belong to the interdisciplinary Society for Judgment and Decision Making, which is dominated by heuristics-and-biases researchers. “It’s still very much us and them, where us is Kahneman-and-Tversky disciples and the rest is Gerd and people who have worked with him,” says Dan Goldstein, a former Gigerenzer student now at Microsoft Research. “It’s still 90 to 10 Kahneman and Tversky.” Then again, Goldstein—a far more diplomatic sort than his mentor—is slated to be the next president of the society. There seems to be more overlap in practical decision advice than in decision research. The leading business school textbook, Judgment in Managerial Decision Making, by Harvard’s Max Bazerman (and, in later editions, UC Berkeley’s Don Moore), devotes most of its pages to heuristics and biases but is dedicated to the decision analyst Howard Raiffa and concludes with a list of recommendations that begins, “1. Use decision analysis tools.” There’s nothing inconsistent there—the starting point of the whole Kahneman-and-Tversky research project was that decision analysis was the best approach. But other researchers in this tradition, when they try to correct the decision-making errors people make, also find themselves turning to heuristics. This has recently been a major research project for Gigerenzer and his allies—he calls it the study of “ecological rationality.” In environments where uncertainty is high, the number of potential alternatives many, or the sample size small, the group argues, heuristics are likely to outperform more-analytic decision-making approaches. 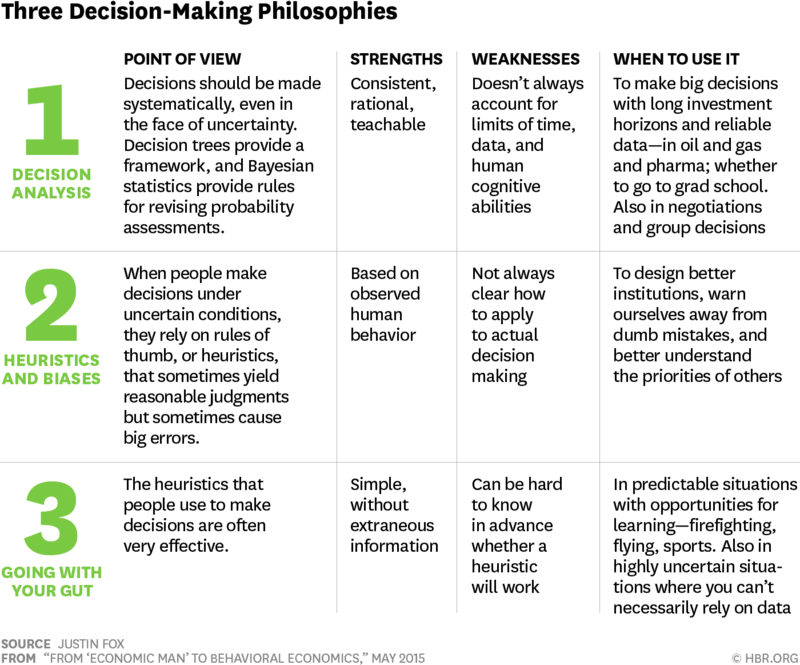 This taxonomy may not catch on—but the sense that smart decision making consists of a mix of rational models, error avoidance, and heuristics seems to be growing. Other important developments are emerging. Advances in neuroscience could change the decision equation as scientists get a better sense of how the brain makes choices, although that research is in early days. Decisions are increasingly shunted from people to computers, which aren’t subject to the same information-processing limits or biases humans face. But the pioneers of artificial intelligence included both John von Neumann and Herbert Simon, and the field still mixes the former’s decision-analysis tools with the latter’s heuristics. It offers no definitive verdict—yet—on which approach is best. A firefighter running into a burning building doesn’t have time for even a quick decision tree, yet if he is experienced enough his intuition will often lead him to excellent decisions. Many other fields are similarly conducive to intuition built through years of practice—a minimum of 10,000 hours of deliberate practice to develop true expertise, the psychologist K. Anders Ericsson famously estimated. The fields where this rule best applies tend to be stable. The behavior of tennis balls or violins or even fire won’t suddenly change and render experience invalid. Management isn’t really one of those fields. It’s a mix of situations that repeat themselves, in which experience-based intuitions are invaluable, and new situations, in which such intuitions are worthless. It involves projects whose risks and potential returns lend themselves to calculations but also includes groundbreaking endeavors for which calculations are likely to mislead. It is perhaps the profession most in need of multiple decision strategies. Part of the appeal of heuristics-and-biases research is that even if it doesn’t tell you what decision to make, it at least warns you away from ways of thought that are obviously wrong. If being aware of the endowment effect makes you less likely to defend a declining business line rather than invest in a new one, you’ll probably be better off. Yet overconfidence in one’s judgment or odds of success—near the top of most lists of decision-making flaws—is a trait of many successful leaders. At the very cutting edge of business, it may be that good decision making looks a little like the dynamic between Star Trek’s Captain Kirk and Mr. Spock, with Spock reciting the preposterously long odds of success and Kirk confidently barging ahead, Spock still at his side. This article originally appeared in [https://hbr.org/2015/05/from-economic-man-to-behavioral-economics] and belongs to the creators.